One of the most important elements of any air sampling protocol is correctly controlling your air samplers. Although most microbial air samplers on the market are stand alone devices, only offering the capability of single sample site operation, EMTEK provides a versatile solution that enables you to operate/control several samplers at once, if desired, lowering your cost per sample location. The V100 Controller can operate multiple sampling heads (e.g., R2S. RAS. And RCG), from a single sampler and up to four (4), and offers multiple flow rates (i.e., 28.3, 50, and 100 LPM), dependent on your monitoring needs. It features an IR remote control, which can control up to 5 V100’s; an on-board thermal label printer, to output and affix to your test plate all key sample run parameters; the ability to view or output data to through a network connection; and a sample memory buffer, from which to later access and output sample run data It’s also lightweight and has a small footprint, enabling you to move it from location to location without any hassle. At EMTEK, we take pride in developing and building the most clean room friendly, accurate, and user-friendly air samplers on the market. All of our products are built to stand up to years of tough use but are also built with space concerns in mind; we know that you have limited space in your critical work environments, and we strive to provide samplers that can do incredible amounts of work but still offer small profiles. Our V100 Controller is designed to provide you with versatile and effective solutions that support your specific air sampling needs. 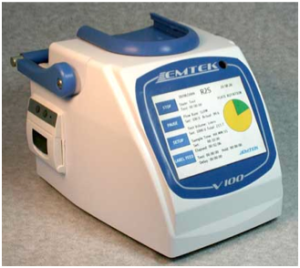 With optimal biological as well as physical collection efficiency, the versatile V100 controller, in conjunction with EMTEK’s line of air sampling heads (i.e., R2S, RCG, or RAS) is able to offer a variety of sampling rates, and configurations, to cover both routine and process monitoring. This product is just one example of how we look to move air sampling technology forward. By centralizing and connecting your air sampling processes, the V100 makes your work more efficient and more accurate. For more information about our products visit www.emtekair.com or contact us at 877.850.4244 with any questions.